Kelpie the motorhome is parked up in the aire at Cherbourg, provided free of charge by the lovely people there, and within a spit of where we disembarked the ferry. Disembarking the ferry at Cherbourg – We’ve arrived in one piece!! 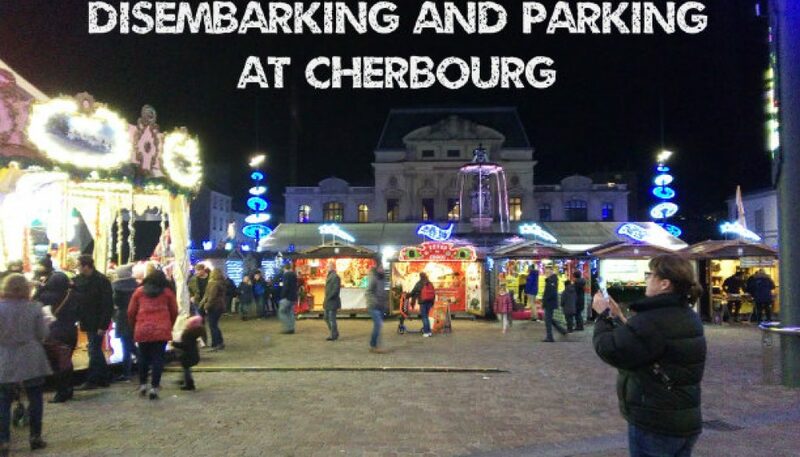 The aire in Cherbourg is located in the docks area close to where the ferries berth. It is fairly new and much needed in the town as there are many motorhomes both arriving and leaving by the nearby ferries. It is adjacent to La Cité de la Mer, a maritime museum which also houses a Titanic exhibition. The Titanic picked up passengers from France at Cherbourg, then departed for Southampton before its fateful voyage. We did not go to the museum as I had recently visited the Titanic Exhibition Centre in Belfast, where the ship had been built. When we arrived at the aire from the ferry, there were about 6 other motorhomes parked up. The Aire at Cherbourg is large with space for about 40 motorhomes, but within a couple of hours of parking, the aire started to fill up with cars. They were parked in every available space, 2 per motorhome bay and even on the footpaths around. Some other motorhomes arrived and couldn’t find any space to park. What was going on? Everyone was heading toward the town centre. We had just started making dinner, so couldn’t go out to investigate, but within a couple of hours people started returning to their cars, children holding helium filled balloons. Another glance toward the town and we could see all the festive lights and realised that it had been the official “switching on” of the Christmas lights. After dinner, we headed towards the town centre which is only a gentle 10 minute stroll from the docks area. We followed the streets lit up with blue and white disc shaped lights and passed an Irish pub on the way. It seems we haven’t escaped yet! No! We have just arrived in France and see an Irish pub! We arrived in the town square where we discovered a Christmas market selling all sorts of festive goodies. Although not as cold as the Ireland we had just left the day previously, there was a winter chill in the air, so we stopped at one of the stalls were we had a couple of glasses of “vin chaude” to warm up. The atmosphere was very relaxed – not like the Christmas market in Belfast which attracts such a number of visitors during the shopping mayhem period that you are shoulder to shoulder pushing through the crowds. We returned to Kelpie to start planning out our route south. We needed a little warmth as winter was fast closing in. Our initial plan is to make our way south easterly through France and cross the border into Spain, then travel down the eastern Mediterranean coastline. Out came the maps and guide books to plot our route ahead. You might have thought we would have done this before leaving home, but we like to fly by the seat of our pants :). Before setting off the next morning, we made use of the service area, also free, emptying our cassette and grey water and topping up our fresh water tank. Thanks to the people of Cherbourg for providing this stop over point.